NEWS FLASH: There is a new shuttle bus serving the BVRT, operated by Out There Cycling. Transport arrangements are a challenge for anyone wanting to do the BVRT from End-to-End without vehicle support, but for walkers and small groups of up to six cyclists, there is a ‘work around’ solution in the form of coach service from Caboolture to Yarraman operated by Pursers Coaches based in Murgon. The coach departs from Caboolture Station every weekday, not including Public holidays and not including weekends. They can carry up to six bicycles in the luggage bay underneath…view timetable. NEWS FLASH for a six-month trial period, bicycles will be permitted on the 529 service…check out the timetable. 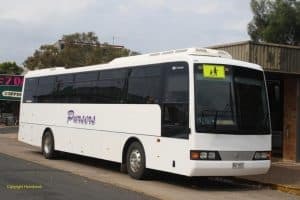 For larger parties, coaches can be hired from Coast and Country Buses. There is also a weekly shopper’s bus that runs from Linville to Ipswich in the morning on Thursdays, stopping at towns along the way, and returning in the late afternoon.